Now you can get more Science Explorer activities and support our museum at the same time. 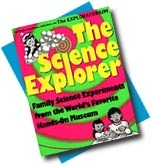 Both Science Explorer books can now be purchased online at our new Exploratorium Store! Bubble Bomb - Using baking soda and vinegar, you can pop a plastic bag with the power of fizz. Balloon Blow-Up -Not all bubbles are made with soap! Bubbularium - Make an observatory to see the amazing colors in bubbles! Up Periscope! - Build a mirrored tube that lets you see around corners and over walls. Outrageous Ooze - This stuff can't make up its mind -- is it a liquid or a solid? Go With the Flow - Spin the bottle to make beautiful swirling shapes! Black Magic - Discover secret colors hidden in a black marker! File Card Bridges - How many pennies will your bridge hold? Geodesic Gumdrops - Make amazing architecture with gumdrops and toothpicks. Super Sparker - Make very, very, very tiny lightning, anytime you want! Remote Control Roller - Rub a balloon on your head, then watch a soda can race across the floor! Pringles® Pinhole - Recycle a potato chip can into a simple camera. Pictures From Light - With a lens, you can bend light to make pictures of the world. Making a Sun Clock - Before there were clocks, people used shadows to tell time! Dissect a Disk - Find out what's inside a floppy disk. Salt Volcano - Make your own miniature "Lava Lite"
Glitter Globe - Make a fantastic toy that shimmers when you shake it. The Amazing Water Trick - Do hot water and cold water mix? Flipsticks - A do-it-yourself cartoon kit. It's easy to make pictures move! Ear Guitar - Share some scecret sounds with a friend. Secret Bells - An ordinary metal spoon can make some astounding sounds! CANdemonium - Recycle some cans to make after-dinner music! Roto-Copter - This simple paper toy spins through the air like a mini-helicopter! Spinning Blimps - Become an aircraft designer! Hoopster - Most paper airplanes are flat, but these paper hoops can really fly! I M O K. U R O K. - You can make sentences without words! Mold Terrarium - Watch tiny blue, green, and white plants grow on leftover food. Copper Caper - Watch old pennies turn bright and shiny right before your eyes!